This page is just a brief overview. As I build the site, each section above will contain more detailed information, but this page should get you started. 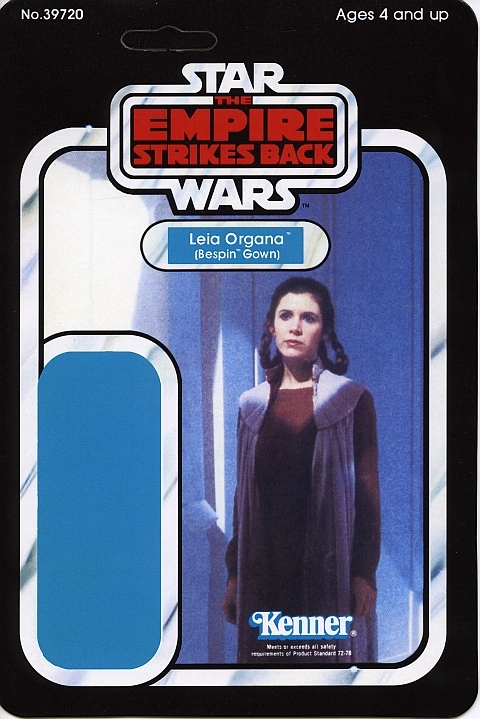 Leia Organa in Bespin Gown first appeared on Empire Strikes Back 31B Back cards. The catalog number was No. 37920 which was the first catalog number for the ESB line. One could argue this officially made her the first figure released for the new movie and ESB packaging... but then there is Boba Fett. 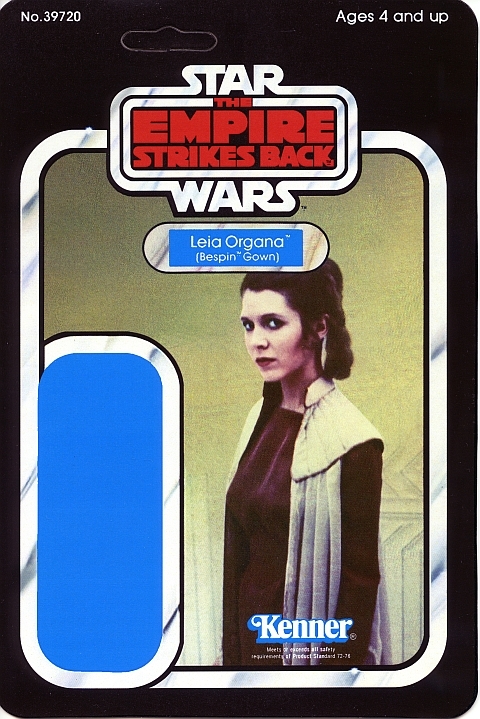 The 31B back front image initially was Leia facing left from the waist up. This image was very short lived and was replaced on the 32B backs and later with a new image of Leia looking more towards the front from her knees up. The image was changed one final time for the Tri-Logos which was almost the same as the 31B back but this time showed more of the original photo showing more of Leia standing. This by far is my favorite images of her since it isn't blocked by any other graphics. RUMOR: the image was changed starting with the 32B backs due to some contrast and detail issues created from the dress and scene behind her from a printing standpoint. Luke Skywalker in Bespin Fatigues also had his image changed from the 31B to the 32B backs and later just like Leia. His Tri-Logo image is different than both preceding images however. This figure is very interesting in that there are countless variations that exist as she was produced over the years. The variations range between minor and major. She was produced from the first 10 figures launched for the ESB line and continued to be produced all the way to the end of the Return of the Jedi cards and eventually on Tri-Logos as well. She was never released on the Power of the Force cards. Having been produced for so long, the molds used to make here were put to their test across many factories around the world. One of the most interesting points of this figure is that she was originally released with a body sculpt that is referred to as a "Crew Neck". While the "Crew Neck" was most screen accurate, at some point relatively early on, the molds were all re-tooled to remove the "Crew Neck" style and instead produce her with a "Turtle Neck" where the dress color went all the way up to her chin. Since the torso was remolded, the heads may have needed to be redone or altered to fit these new torsos. This "Turtle Neck" variant is not screen accurate but there had to be a reason for the change. It may have simply been done to have fewer areas to paint and deal with in Quality Control. It also could have been to correct her neck being a little too wide for a woman's neck. We may never know why. Another neat fact is that when the change to turtle necks occurred, they started applying lipstick to the turtle neck figures. Previously, all the Crew Necks had no lipstick. Leia Organa in Bespin Gown is one of the very few figures that have a true major mold based variation! By major mold based variation, I am referring to a completely new mold or portion of the figure being created to correct an issue with the original.